Iowa wildlife experts are celebrating the rebound of North America’s largest water fowl. A campaign to restore the trumpeter swan to Iowa began in 20 years ago. Dave Hanson is a wildlife research technician with the Iowa Department of Natural Resources. He’s been tracking the re-population effort around the state, including a water fowl production area in Hanlontown about 10 miles north of Clear Lake. “There’s a bonded, mated pair that has taken up residence here at Hanlontown Slough. Their young cygnets, the young produced here last year, are flying around the area here and, so to speak, mama and papa are giving them the boot,” Hanson said. The trumpeters vanished from Iowa in the late 1880s as they were hunted by early settlers. The swans’ habitat was also depleted as Iowa’s wetlands became farmland. Seven years ago, Hanson placed 163 acres of his own farmland in Cerro Gordo County into the Wetland Reserve Program. “They broke all the tile that my father put in years and years ago, and dug out the places…that were indicated by the soil type that were wetland soil types, and just let nature do the rest. Now, the ponds are back,” Hanson said. The Hanson everglades boast a dozen ponds and the trumpeter swans have noticed. This spring, Hanson is hoping to attract a nesting pair. Iowa now has 50 nesting pairs of trumpeter swans and few people are more elated about that than Ron Andrews. “Well, it’s a spectacular feeling. 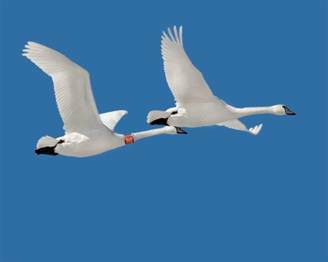 Little did I dream, but was hopeful, 50 plus nesting pairs of trumpeter swans in Iowa is way beyond our first expectation goal, which was 15,” Andrews said. Andrews is a retired D.N.R. officer who helped launch the swan re-population program. Trumpeter swans are protected in Iowa. There’s a $1,500 fine for killing one.